As I looked in my feed reader this morning, I realized everyone's talking about the upcoming Google PageRank update. At the time of writing this, it seems that Google is updating the toolbar PR ratings, and a full PR update is expected sometime in the next week or so. Hopefully the recent PR drops for sites using advertising methods Google disapproves of has come to an end, and we will finally see a true PR update in the next few days. If you've noticed any changes in PageRank (or know of a reliable PR checking site which is currently operational) please let us know by leaving your comments below. You've probably seen "ajax-style" loading icons before. These small animations appear on web-pages while page elements are loading, and disappear (or are replaced by content) when the page has fully loaded. Inspired by the page loading feature I noticed in Meta-Microcosmos, I decided to find out how to add an animated ajax-style loading icon to Blogger templates. After a little trial and error, I discovered a solution which is cross-browser compatible and can be added to your template in one easy step. So in this tutorial, I'll explain how you can add an ajax-style page loading icon to appear in the top corner of your Blogger template which disappears once the page has loaded. This small, unobtrusive image has a minimal file size, and is easy on the eyes so it doesn't detract from other style elements of the page. Of course, if you would prefer to use a different icon, you can change the URL of the image in the code used for this hack as I will explain shortly. Adding this page loading icon is as simple as copying and pasting a section of code! Simply go to Layout>Edit HTML in your Blogger dashboard, and find the opening <body> tag. You can then preview your blog to see the page loading icon appear in the top right-hand corner of your blog template momentarily until the page has loaded. Providing there were no errors received when you previewed the page, you can then proceed to save your template. Of course, some of you may prefer to use a different animation to the one featured here. I had originally experimented with the script used in Meta-Microcosmos to feature the loading icon which is housed in the <head> section of the template. However, this caused some problems when viewed in IE6 as this caused the icon to appear above the template, rather than in the corner (it occasionally caused the page to freeze too!). So instead I adopted this version which uses the body onload function to cause the script to take action. This ensured that the icon appeared correctly in all browsers I have tested in, including IE6 and 7, Firefox and Flock. If you notice any problems in other web browsers, please let me know about this! While this Blogger hack may be mostly cosmetic, it is a fun and interesting feature which can add style and personality to your template design. I hope this article has been useful for you! If you have enjoyed this tutorial, please consider subscribing to Blogger Buster for future tutorials and Blogger news. Blogger has recently updated some elements of the system. Blogger Buzz announced some bug fixes a few days ago (which should solve a few of the problems we've had managing our blogs) and also a couple of interesting updates. Furthermore, it should be a little easier for bloggers to find help when needed thanks to a dedicated page which explains how the support system works. The "Add another image" link in the image upload window now works even before you have specified an image to upload. Better predictability for auto-completion of labels in the post-editor's label field. For the full list of bug fixes, pop over to read the post on Blogger Buzz. All other support queries should be directed towards the Blogger help group or resolved by reading through the official Blogger help center instead. If only Blogger would offer some sort of dedicated email support though: I'm sure hundreds of Bloggers would be incredibly happy! CATCHPA Problems? Blame the Spammers! Many Blogger users have complained about the problems deciphering Blogger's CATCHPA (Completely Automated Public Turing test to Tell Computers and Humans Apart). From what I have read on other sites, I imagine this is linked to spammers having discovered a method of bypassing the earlier system in order to create spam blogs, many of which lead to sites which infect our computers with spyware. Blogger have been trying hard to reduce spam in Blogger hosted blogs in recent months, and it seems the increased CATCHPA protection may be an effort to counteract the automated spammers invading this free service and giving Blogspot a bad name! Because of this problem, many Bloggers may opt not to use comment verification. After a few complaints, I'm wondering if Blogger Buster should remove this too.. It seems that CATCHPA is no longer a viable tool for deterring spammers, but we can hardly blame Blogger for that! Any free service which can be manipulated by spam-bots will continue to be abused, whether this is Blogger or any other free hosting service. I only hope that the Blogger team may implement a solution soon which will be of benefit to us all. If you've read through the recent bug fixes page, you would be forgiven for having overlooked this new feature. XFN (XHTML Friends Network) is a way to demonstrate relationships between the authors of web pages by adding rel="me/friend/sibling/spouse/etc" to links in your blog or in the head section of your template. Blogger now automatically adds a rel="me" statement in your blog's head section which links to your Blogger profile page. This demonstrates that your blog is owned and maintained by you, which is helpful for services such as LinkedIn, MyBlogLog and Ziki which use and understand these XFN relationships. I'm going to write up a full post about XFN annotations and their uses in the near future which I hope will offer you a better understanding of how this works and how it XFN links may be implemented into your Blogger templates. In the meantime, you may want to take a look at the XHTML Friends Network site which offers an easy to understand introduction to XFN. I hope you have enjoyed reading this summary of Blogger related news and updates. As always, your comments and opinions are much appreciated! An archives page can be a really useful place for your readers to locate posts of interest or simply browse through your previous posts at leisure. Recently I've received some feedback from readers who suggested I create an easier method to browse previous posts. So I decided to create a dedicated "Archives Page" which I hope will help readers easily locate previous posts to suit their needs. My archives page features links to my monthly archives, an explanation for each category and also a simple search function for easy browsing. In today's post, I'll explain how I created my Blogger archives page, and list some of the reasons why this method of archiving could be useful for you too. Most successful blogs feature a link to their archives pages for visitors who would like to read through previous posts. Such archives pages need not be limited to temporal pages which contain links to a monthly or weekly list of posts though. 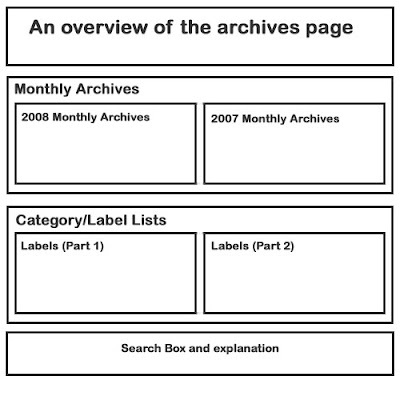 You could also use an archives page to link to your labels/categories and provide an explanation of your filing system which can help your readers locate posts of interest. Blogger does not offer us a template to create an archives page for our blogs. Instead, we have an "Archives" widget available which you can add to your sidebar (or indeed anywhere you are able to insert a new "Page Element" within your template). However, such widgets don't offer much of an explanation for your readers about your archiving system. Also, if you have been blogging for a long time (or use weekly/daily archives) this list can become quite long. Creating a dedicated archives page for your blog allows you to offer your readers a better insight about your blog, offer an easy means of locating and browsing through previous posts, and may be styled in any way you like. When creating an archives page for your Blogger blog, you must understand that there is no magic script which will generate all necessary links for you. Instead, we have to manually create all links to our monthly/weekly archives pages, and also to any labels pages we may like to present. While this may seem like a daunting task (especially if you have a huge backlog of posts or a large number of categories), the good news is that once you've compiled your page you can periodically update this with much less effort. For your own archives page, you may prefer to include a slightly different set of links, such as a list of your most popular posts or important pages from your archives. Once I had decided what I wanted to include, I set about designing the format I preferred to present these links in. While long lists of links was an option, I decided to make better use of the page and use a columns system so that each set would be divided into two columns on the page. The final DIV with the "clear: both" styling ensures that any content beneath the columns does not bunch up between the columns and disorganize the array. This method of styling your post can only be achieved when editing your posts in Edit HTML mode, so if you usually use the Rich Text editor for your posts, you may need to switch temporarily in order to duplicate this process. As I mentioned earlier, it is necessary to add these links manually. The easiest method is to add both a label and archive widget to your sidebar (you can always remove these afterwards), then open up your blog in a new tab or browser window. Then on your post editing page (in a different tab/window to your blog) write the link text for each archive/label. Copy the required links from your sidebar widgets (usually you can right click on a link and choose to copy the link location to your clipboard), then use the hyperlink function in your post editor to add these links to your post. This simple search code is the same which is used in the Blogger nav-bar which searches through your posts to provide relevant search results for your readers queries (read more about this simple search function). Like other pages you may like to create for your Blogger blog, it is a good idea to backdate this post so that it doesn't appear to be a recent blog entry. You can do this by changing the date in the "Post Options" link below your post editor. Then once you have saved your post, locate the URL for this in the Edit Posts page of your Blogger dashboard and copy this link to your clipboard. Finally, add a link to your archives page from somewhere in your blog template. If you have a navigation bar in your design, this would be an ideal place to feature your link so readers can easily locate this. Alternatively you may prefer to add a link in a sidebar widget, or in the footer section of your blog. I placed a link to the Blogger Buster archives page beneath the search box in the header section, among other important links. And there you have it: a custom-made archives page for your Blogger blog! I hope you have found my explanation useful to help you create your own archives page using Blogger. I would love to see other examples of Blogger archives pages, so if you create one of your own, please let me know by leaving your comments below. I've been working on a script which you can use to change the background color, or even any other background element of your blog, depending on the time of day. You can see this script in action on the Time of Day test blog. Here I have used the script to change the main background color of the Minima template according to the time of day. Take a look at different times to see the changes take effect. This means you can choose the color scheme which would work best for your existing fonts and color settings without having to also change the colors of existing elements in your blog. If you would prefer to use your own color schemes, add images to the background, or change the background of other elements of your blog, I have also provided instructions for you to customize this script and adapt it to your own personal needs. Now preview your blog. If all has gone to plan, you should see the background color of your blog has changed to the color specified for the time of day. You can then proceed to save your template. First you should download a copy of the Time of Day Background script, then make your changes in your favorite editor (I use Notepad ++ though you could just as easily use Notepad or another simple text editor). Once you have made your changes, you will need to upload your revised script to a hosting provider, and link to the script from the <head> section of your blog template as described above. I'm currently working on a new template for Blogger blogs which uses a variation of this script in a rather elegant way. I will put this up for download as soon as it's ready, but in the meantime I would love to see how you have used this script to personalize your own blogs! Twitter has become one of the most useful social applications for bloggers. Many bloggers choose to feature their latest updates in a widget visible in their blogs. Here at Blogger Buster, for example, you can see a Twitter widget in the header section which features my latest "tweet". Many readers have emailed me to ask how I customized this widget, so in this post I'll explain some methods you could use to create and customize your own Twitter updates widget, including a simple widget installer for you to add a widget similar to the one used here. Twitter does offer a "Blogger" widget which can be installed using a one-click installer. This widget does not have any styling associated with it, ensuring your updates will appear in the same fonts and colors as other widgets in your blog. If you have already added a Twitter widget to your blog, you can easily customize the appearance of this widget using some simple CSS techniques. As you can see from the comments I added in red, you can add inline CSS styling to your widget code, in order to add borders, background color or even an easily recognizable icon. style="border: 3px solid #cccccc; padding: 5px;" <--This will add a wide grey border around the widget with some padding to ensure the text doesn't get too close to the edges. style="background: #ffcc00;" <-- This will add a bright yellow background to the widget, ensuring this contrasts with other elements in the page. style="background: url(http://imagehost.com/youricon.jpg) top left no-repeat; padding-left: 50px;" <--This will add an icon as a background image to your widget. The padding declaration ensures the text does not overlap the icon (this is the solution I use to feature the blue bird in my Twitter icon in the header section). and add your styling code to this section. The colors and fonts of this widget will blend with other elements of your blog, while the Twitterific icon will be easily recognized and help your readers associate this widget with Twitter. To add this widget to your blog, simply fill in the details in the form below. Your Twitter username is the one which you have chosen to represent you on Twitter. For example, my username us "amandafazani" and my Twitter URL is http://twitter.com/amandafazani. Add this username into the appropriate box, then change the title and number of tweets to display as suited to your needs. I hope this post has been informative in explaining how you can add style to your Twitter badge/widget in your Blogger blog. Please let me know what you think by leaving your comments below. Here is a complete list of all the tutorials posted on Blogger Buster, organized by category. So please, dive in and read the tutorials which are most useful to you! Click on a category heading to skip to this section of the article. This section features important news and tutorials relating to your use of Blogger.com. Does Blogger Leave us Vulnerable to Impersonation? This section features tutorials in regard to using Blogger's "custom domains" service. This section features all the articles I have written with regard to customizing your Blogger templates. 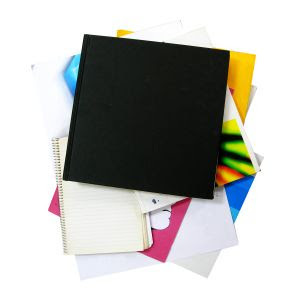 I have further divided this category to help you easily find a particular customization for your needs. Here you will find links to posts which discuss general/overall aspects of customizing your Blogger template. These tutorials can help you develop the header and navigational areas of your Blogger template. What Makes a Great Blog Header? Here you can find links to articles which discuss styling of the main posts area, including the comments and post-footer sections. This section focuses on customizations for the footer section of your blog. These articles discuss your blog feeds and blog syndication. What is a Blog "Feed" and Why Do I Need It? Here you will find articles regarding the use if imagery in your Blogger template and posts. This section contains articles discussing the use of labels, categories and tags in Blogger blogs. These posts feature information about adding advertisements or using Google Adsense in regard to your Blogger blog. Here are posts discussing useful resources for bloggers. This category features posts which discuss search engine optimization (SEO) and generating blog traffic. Here are articles featuring widgets and add-ons which you can use to add functionality to your Blogger blogs. What are Widgets and How do I Use Them? This list will be updated periodically with new articles as they are published on the site. You may also be interested in subscribing to Blogger Buster to receive updates and news articles as they are posted. I'm always open to suggestions for future articles, so if you have an idea for an article you would like to see published here, feel free to drop me a line. 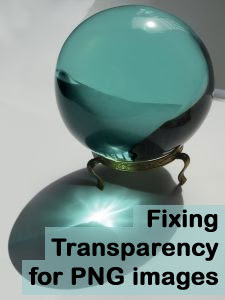 If you would like to use any transparency for images in your blog, you should be aware that Internet Explorer 6 (and below) does not render PNG transparencies. So if you use a PNG image with semi or full transparency, you would probably see this rendered against a white/grey background when viewed in IE6 (whereas Firefox and other browsers are able to render the transparency just fine). One solution to this problem is to use GIF images instead, but this does lead to some compromises in design as the GIF format cannot render semi-transparency (where some of the background color is visible through the image). Recently, Smashing Magazine posted a wonderful article discussing the use of transparency in modern web design. Many solutions for PNG transparency were referenced in this article, but there was one incredible fix which the author missed out: NaterKane's BgSleight script. Unlike the PNGfix script (which many of us have used to render transparency for foreground images), this script can also display PNG transparency for background images too! It uses a transparent GIF image as a background to the PNG transparency, and although the effect does not render until the page has fully loaded, I'm sure you'll agree this is the best solution so far when using transparency in PNG images for your blog template design. Unzip this file and save the contents to a location on your computer. Then upload both bgsleight.js and blank.gif to the same folder location in your hosting account. You can find a list of free hosting providers here if you do not already have a hosting account for your scripts. Don't forget to replace yourhost.com with the URL where you have hosted your bgsleight file! Now when you upload any PNG image with transparency (full or semi-transparency) to your blog template, the page will be rendered correctly for IE6. As I mentioned before, the transparency will not take effect until the rest of the page has loaded, so for a second or so you may still see a border or pale background around your transparent PNG elements. Once the page has loaded, all of your images will appear just as they should, enabling you to create some great effects in your template design. You may also want to check out Fonsite and Flair in the City to see how this script has been used in other Blogger powered blogs. The bgsleight script was originally developed by NaterKane and is distributed under the Creative Commons 2.5 License. Thank you also to Alfonso of Fonsite for telling me about this highly useful script! If you have enjoyed this post, please consider subscribing to Blogger Buster for updates of future articles. I doubt there's anyone using Blogger who hasn't come across one of those dreaded bX-codes at some point or another. These codes are created by the Blogger system when an error occurs to help the Blogger team track down and solve any problems. The code refers to a JSON-callback to the Blogger Error Codes blog. This is used a "database" of error codes which is used to display a message if the specific error code has been registered on this blog. 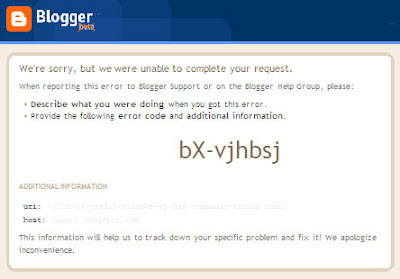 The Blogger Error Codes blog uses posts organized by labels attributed to a particular error code. When a particular error occurs, the error page references the bX-codes blog. If this matches an existing label, the body of the post attributed to this label is used to display a message to the user to inform them of the problem or explain that the Blogger team are aware of the problem. Unfortunately, the error codes blog is not updated very often. This means we usually receive a default error message telling us to inform Blogger of the error code and a description of what was happening when this occurred. Generally speaking such errors are resolved soon after they appear, especially when people report these error codes directly to Blogger to ensure Blogger employees are aware of the problem and it's scope more quickly. Report your bX-Error code to Blogger: Use this form to report your bX-codes to Blogger directly. The Real Blogger Status (BX codes Section): Chuck is doing a great job of documenting error codes and recent issues with Blogger. In this section of his blog, you'll find loads if useful information about bX-error codes, including their status and possible resolutions. Blogger Known Issues: Here the Blogger team document known issues and error codes with status when these issues are resolved. The Blogger Help Group: It may be helpful to search the official Blogger help group for the bX-code you have received. If this has been experienced before, others may have posted a solution. You may also want to report your error code here as Blogger employees do keep an eye on the help group. As we can now report error codes directly to Blogger, I hope this will result help the Blogger team correlate and resolve specific codes more quickly. It would be reassuring to receive more messages on our error screens: "Engineers are aware of the problem and are working in a fix" is so much better than a default message telling us to report the problem! If you know of other useful resources about Blogger's error codes, please let us know by leaving your comments below. While researching blog designs, I came across a really feature: an icon link to the top of the page which floats in the bottom right-hand corner. As a blog reader, I found this feature to be really useful as it enabled me to jump back to the top of the page after reading a long article or browsing through many posts on the home page. Take a look at the bottom right hand corner of this blog for an example of this in action. So in this post, I'll explain how to add an icon link to the top of your blog with an example image and code for you to use this right away. The icon is styled to appear in the bottom right-hand corner of the page (no matter what screen resolution a visitor uses to access your blog), and is linked to target the top of the page using the "#" symbol. The icon link used in this blog is small and unobtrusive; to help new visitors understand how this can be used, I added title text to the image so the "Back to Top" prompt will appear when the visitor hovers their mouse over the link. If you use a Classic Blogger template (with no drag and drop widgets), you can paste this code into your blog's HTML code, somewhere between the <body> and </body> tags instead. If you would prefer to use a different image than the one used here, simply replace the URL of the image with the URL of your preferred image instead. To position the icon further away from the right or bottom sides, simply increase the pixel value to reflect this distance. Left: La Blogueria uses paperclips to link to the top (and other parts) of the blog. Center: In Tuneando el Blog, the icon link is animated when the mouse hovers over it! Right: This page curl at the bottom right of Mi-Microsmos is a cleverly disguised (and very stylish) link which features a prompt on mouseover. I hope this tutorial has been useful and helped you create your own scrolling icon links to the top of your blog. If you have found this post useful, please consider subscribing to Blogger Buster for updates of new articles as they are published. 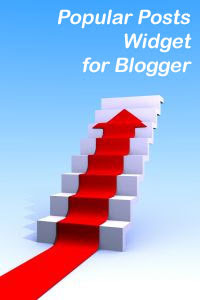 Blogging Tips is a group blog where regular writers offer articles and advice about blogging. For the past couple of months, I've been writing regular posts for this popular blog and am now a weekly (staff) writer! Plus a few more too! Blogging Tips features some really useful posts about blogging in general. My articles about Blogger are published regularly each Monday, so if you're looking for more resources and articles to help you blog more effectively, please check out my posts at Blogging Tips and let me know what you think! Here is a Popular Posts widget for Blogger blogs which displays a list of the ten most commented posts. This works by parsing the last 5000 comments which have been made on your blog; the post titles and URL are extracted and displayed in descending order of popularity, followed by the comment count of this post. Over the past few weeks, many of you have expressed an interest in such a widget, and I hope this will become a useful widget for you all. You can see this widget in action and install this in your own Blogger powered blog using the widget installer below. Please note: if you are reading this post in your feed reader, you will not see the widget installer and will need to visit this page in your browser instead! On the right you can see an example of the Popular Posts widget, which displays the ten most popular posts from Blogger Buster (including their comment count). This widget uses Yahoo! Pipes to parse and display each item in the list using the last 5000 comments which have been made on this blog. Change the title of the widget if you prefer. Click the "Customize" button to make the changes take effect, then click on the "Add to Blog" button. At this point, you will be taken to the widget installer page where you can choose which of your Blogger powered blogs you would like to install this widget. O Ricardo traduziu este widget para Português que pode ser encontrado nesta página. I have developed this widget using Yahoo Pipes, where I added variables to retrieve 5000 comments and extracted the titles and URLs using Regex (regular expressions). If you would like to take a look at how this works, feel free to hop over to the Blogger Popular Posts/Most Commented Pipe page where you can also make a copy and edit to your own specifications. However, using Blogger's Feed Widget will limit the number of items you can display to 5 instead of 10, and you will not be able to number your items. Double check your blog's URL when you add this to the widget installer, and remember not to add the "http://" part as this is already added by the script. To remedy this, go to Settings>Site Feed in your Blogger dashboard and click on the "Advanced Settings link. Here you will see the option to switch your comments feed to Full or Short instead of None. I have tested this widget extensively for both Blog*Spot and custom domain URLs in Internet Explorer and Firefox. So far, I haven't come across any problems, though if you do have a problem with this widget which I've not covered here, please do leave a comment or get in touch and I will try to help. If you have found this widget to be a useful addition to your Blogger blog, please consider subscribing to the Blogger Buster feed and be updated of new articles about Blogger as they are posted. These "bX" error codes are unique to each problem encountered, and offer the Blogger team information about how this can be fixed. I doubt that the Blogger team would be able to offer a personal response to each report they receive, but you can be assured that the team will be working on a solution to ensure these errors are fixed as soon as possible. For more information about this, you may like to read the announcement on the Blogger help group. The Blogger help group also has many posts relating to known error codes, where you may find an solution to a problem you are experiencing with your blog. I hope this information will be useful to many of you on the occasions when you may receive error codes when publishing your blog. While there are many ways you can style your blog template to make it look more appealing to your readers, many bloggers pay little interest to styling their blog posts. Long monotonous blocks of text can appear boring, but there are many different techniques you can use to make your posts more stylish, interesting and ultimately more compelling to your readers. Here are fifteen different techniques including some which you may not have considered using before! Styling areas of your text in an unusual way helps draw attention to important sections of your posts. These are the simplest of all textual effects, though such effects should never be underestimated! Bold text, for example, reinforces important words or sentences in your article and adds a sense of authority. You can easily make text bold, italic or in a different color by highlighting and choosing the relevant option in your post editing dashboard. This is a style most prominently used in magazines, but that doesn't mean you can't also use it for your blog posts! Here Lisa uses a larger italic font for the first phrase or so of her posts which really makes them stand out! This is another typographic style which is typically found in magazines. Blockquotes are generally used for long quotations and are usually separated from the main body of text by indentation, italics or a different style of font. Using CSS you can change the appearance of your post blockquotes as I wrote about in this previous article. Pullquotes highlight a particular sentence or phrase of importance within an article; they are similar to blockquotes, but are generally aligned to the left or right of the main text. This feature is particularly useful when writing longer articles and is a technique I use frequently now in Blogger Buster. Headings break up long sections of text into more manageable chunks, and help readers understand at a glance exactly what to expect from the consecutive section of text. Upper heading levels (eg: H1 and H2) should be used for titles, and are usually in a larger or bolder font. Lower levels (from H3 to H6) may be used as section headings. Headings are supported by all web browsers, and will appear in different font sizes even if you haven't added relevant styling code in the style section of your blog. Hobo-Web has a great article about the use of headings in blog posts which makes for an interesting read! This is a rather unusual method of styling your blog posts, but it is certainly one which can attract attention! The method I'm using here is generated by CSS Text Wrapper, which you can use to shape areas of text into any shape you like! On the examples page, you can see circles, zig-zags and even a wine glass shaped block of text! Check it out and let me know what you think about this unusual method of styling your posts. Using images is one of the easiest and most effective ways of adding style and interest to your blog posts. Here are some different methods you could use with particular regard to imagery and styling images in your blog. One of the most effective ways I've seen other bloggers add style to their posts is by using a consistent theme for images throughout all of their blog posts. 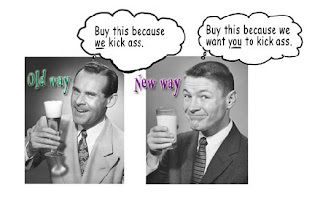 Probably the most striking example of themed images I've seen is featured in Kathy Sierra's blog, Creating Passionate Users. Here Kathy illustrates her concepts using black and white photographs of people which are highlighted with speech bubbles and colorful text. You may also want to check out Woork and Skelliewag to see other examples of consistent image themes throughout their blog posts. I've always thought that photographs presented in frames look much better than those simply stuck to the wall with sticky tape, and the same can apply to images in your blog posts too! 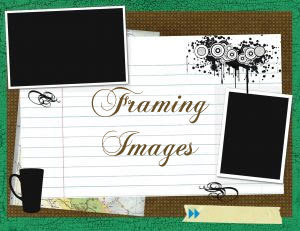 You can change the border and background colors to suit your own template design which will create a style of image framing that is all your own. 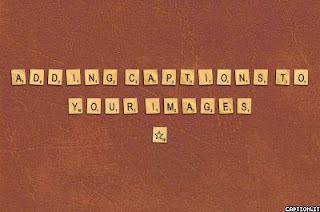 Adding captions to your images is a useful way of adding interest or styling the attribution text. This post explains how to add captions to your images in Blogger posts. 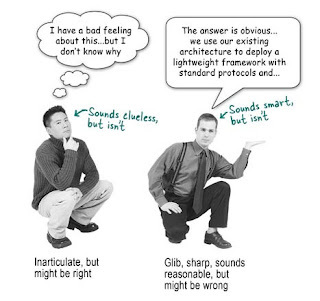 If you would prefer to add these captions dynamically to every image, check out this article by 1976 Design. The easiest tutorial I have found for this so far is at 1976 Design, where you can download the full source code and example images to add drop shadows to images in your own blog posts. This technique works by adding a background image to the DIV section which holds your image, and adding style to the image (negative margin values) which draw the image up and away from the DIV edges. Vin of Dummies Guide to Google Blogger wrote a more in depth article about this which offers more specific advice for Blogger users. Yet more Stylish Techniques for your Posts! These last few ideas were a little more difficult to categorize, though they are undoubtedly fun and useful additions for your blog posts! This is another technique which intrigues me (and one which I'm considering adding to Blogger Buster in the near future). This technique uses CSS with HTML selectors to add icons automatically beside your text links which are relevant to the file or page you are linking too. The best tutorial and download files I have found for this was written by Alexander Kaiser of Poolie Studios and I would really recommend anyone interested in adding this functionality to their blog to check out his project page! In the near future, I'll probably write a tutorial explaining how to add this functionality to your Blogger powered blogs too. StartFound is a really useful service which allows you to embed a widget in your posts with relevant information about internet-based companies you may discuss in your articles. It's free to use and you doesn't include obtrusive branding which other such widgets may contain. What's more, it's incredibly easy to use: simply click on the plus symbol in the top left-hand corner of the company you wish to add, then copy/paste the code presented on the next page. I wrote about Zemanta a short time ago and am so far impressed by how well this engine works. Zemanta offers a few different methods to spice up your blog posts, including image thumbnails, articles, links and tags for your posts. Zemanta works as a Firefox extension and automatically adds suggestions to the right of your post editing page when you are creating a new post. You can read more about Zemanta and download your Firefox plugin on the Zemanta website. I hope you've enjoyed reading through this list of techniques to add pizazz to your regular blog postings! If you have any other ideas, please share these by adding your comments below. If you've enjoyed this article, please consider subscribing to Blogger Buster and be updated of new articles when they are posted.